Imogen Cunningham is famous for her sensual, pure, and mysterious photographs of flowers and intimate nudes where the bodies of the subjects often resemble flowers. Her portraits of people, including the artist Frida Kahlo and actors Spencer Tracy, Cary Grant and others are also stirring. She also took quiet but dramatic photos of her family, especially her father and mother. Cunningham was born on April 12, 1883, in Portland, Oregon, to Isaac and Susan Elizabeth Cunningham. Like many famous photographers, her fascination with the art form began early and she bought her first camera when she was 18 years old. However, she grew bored with it and eventually sold it. But her enthusiasm for photography was rekindled when she saw the photographs of the American photographer Gertrude Käsebier, who was famous for her portraits of Native Americans and sentimental portraits of mothers and children. Käsebier also supported the idea of women taking up photography as a profession, which also attracted Imogen to photography. Cunningham was not just interested in photography as an art form. She wanted to know the chemistry of photography. She began to study this while she studied at Seattle’s University of Washington under chemistry professor Horace Byers. She partially paid for her schooling by taking photos of plants for the school’s botany department. After Cunningham graduated in 1907, she felt confident enough in her photography to go to work in the studio of Edward Sherriff Curtis, who, like Käsebier, specialized in portraits of Native Americans. Two years later, Cunningham, thanks to a scholarship she had won from her sorority that would allow her to study abroad, went to study at the Technische Hochschule, now the Karlsruhe Institute of Technology, in Dresden, Germany. While there, she studied under Robert Luther. Though she did not do much in the way of doing photography, she still continued in her studies of the science behind it. In 1910, she submitted a paper on how to achieve sepia tones, faster printing speeds, and increased clarity. On the long trip back from Germany to Seattle, she met Käsebier as well as the photographers Alfred Stieglitz and Alvin Langdon Coburn. Once she was back in Seattle, Cunningham opened a photography studio and began to be noticed for her work. She had shows at prestigious galleries and academies in New York and had a grouping of her photos published in a major magazine. Cunningham married Roi Partridge in 1915. An artist himself and a teacher, he also posed for her. They had three children together and moved to San Francisco in 1920, where Partridge taught at Mills College. In the meantime, Cunningham returned to her botanical photographs. She also created industrial photographs. In 1929, ten of her photos, including Two Callas, were included in an exhibition entitled Film und Foto, curated by the renowned photographer, Edward Weston. Over the years Cunningham became more and more interested in the human form and especially human hands. She also began to photograph notable people and was hired by Vanity Fair, where many of her portraits of movie stars were published. She also co-founded the Group f/64, a group of San Francisco photographers who shared similar styles and interests. But her increasing fame and demand as a photographer caused problems in her marriage and she and Partridge later divorced. 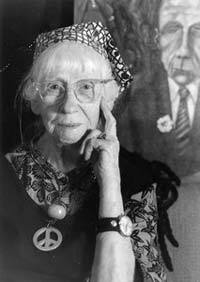 Imogen Cunningham worked as a photographer almost up to her death in 1976. She was 93 when she passed away on June 24 in San Francisco.